The average investor will contend with the ask and bid spread as an implied cost of trading. 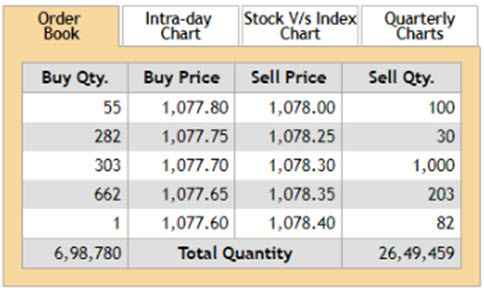 For example, if the current price quotation for Reliance Industries is 1,077.65 / 1078.30, investor A, who is looking to purchase Reliance at the current market price, would pay 1078.30, while investor B who on other hand wishes to sell Reliance at the current market price would receive 1077.65. In case of a security, if it is expected that the stock price will rise, then the buyer would purchase the security at a price that he considers fair. The price at which the buyer is willing to purchase the stock is called as the Bid. In future when the prices fall, the buyer is now a seller. He will now quote a price which he considers selling in which he can make maximize his profit that price is known as the Ask. Mostly, the bid price is usually quoted as low and will also be structured in such a way that the desired outcome will be achieved. Since the seller will never sell the security at a smaller rate the ask price has to be always higher. For e.g., if the ask price of a security is $4,000 and a buyer is willing to purchase it for $3,000, then he will quote an amount of $1,000. This might appear like a compromise and both the parties will try to find a mid-path and will agree at a price where they wanted to be. There can be a case that several buyers that are bidding for an amount which is higher, however, the same will not likely be applicable in case of ask. The bid-ask spread can only be in positive when the Bid price is smaller than the ask price. A spread that is higher will indicate the difference which is wide between the 2 prices that could be due to a lack of liquidity. This could also make it difficult at times to generate a profit as the security will always be bought at a higher price and will be sold at a lower price. Basic Definition Bid price is the maximum price that the buyer is willing to pay for the stock or the security price. Ask price is the minimum price that the seller is willing to sell the stock or the security price. Range Bound This rate will be usually higher than the market price of the stock. Ask price will be usually below than the market price of the stock. Which Rate is higher? Bid rate is always the left one quote and is less than the ask price. Ask price is higher than bid price and is the right side of the quote. What does it represent These will be the highest bids currently and there would be in line with lower bids as well. These are the highest asks currently and there would be higher bids in a queue as well. Users Sellers of the stock will use the bid price. Buyers of the stock price will use the ask price. Broker perspective Bid price is the selling price for them and hence they try to extract the maximum from the buyers. Ask price is the price at which the brokers purchase the stock and hence they try to lower the price from their side. Convention: Say bid price $16 x 130 that means the potential buyers will be bidding at $16 for up to 130 shares. Ask price $28 x 109 would mean that there are potential sellers willing to sell at that price to 109 shares. Bid-ask spreads can vary widely, depending on the stock or security and the market. Blue-chip companies which constitute the Dow Jones Industrial Average may have a bid-ask spread say of only a few cents, while a small-cap stock may have a bid-ask spread as high as of 50 cents or more. The bid-ask spread can widen dramatically during the periods of market turmoil or illiquidity, since traders will not be willing to buy at a price beyond a certain threshold, and sellers also are not willing to accept prices below a certain level. This has a been a guide to the top difference between Bid Price vs Ask Price. Here we also discuss the Bid Price vs Ask Price key differences with infographics, and comparison table. You may also have a look at the following articles to learn more.